So, that friend with the amazing vintage fabric stash? She also had this amazing denim. Yards and yards! I never actually measured, but it was probably north of twelve yards. And she could tell by the way my jaw dropped when I saw it that I really wanted to make something from it. Had to add a cute label. And I used the same aqua to line the pockets. Of course, I wanted to make another pair of Parsley Pants! A pair for Dell and a pair for her daughter. And it was pretty easy since they're mostly the same size, just do everything twice. This was my first time trying piping. I found a couple packages of this pink piping for next to nothing at our guild trip to Marden's, and it turned out to be the perfect color. I'd read tutorials (there's this one from MADE, and this one from Made by Rae) and new it wasn't hard to do, but I thought it would be more difficult to make it look good. Not really, all I used was my zipper foot, and pinned a little extra. And, I did both pairs with one package, leaving me three more packages of piping to make more pants. And Dell approves. She's been collecting treasures lately, especially flowers and tiny My Little Ponies, so she needed some real pockets. I just have to remember to start checking hers when I do the laundry. So, next up is making everyone I know a pair of Parsley Pants out of the blue denim I managed to sneak out of the stash. And I have green and dark green piping to trim out the pockets. I think this pattern is turning out to be one of my favorites. The look of a girl who has fun pants and has been bribed to pose with globs of peanut butter. Very satisfied. 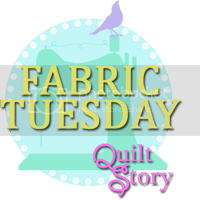 Linking up with I Have To Say for Show and Tell Tuesday, and Quilt Story for Fabric Tuesday!